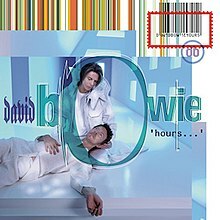 Hours (stylised as 'hours...' ) is the 21st studio album by English singer David Bowie. It was released on 4 October 1999 on Virgin Records. This was Bowie's final album for the EMI sub-label. It was the first complete album by a major artist available to download over the Internet, preceding the physical release by two weeks. Hours was the first Bowie studio album to miss the US top 40 since his 1972 album The Rise and Fall of Ziggy Stardust and the Spiders from Mars and peaked at number 47. Bowie and Reeves Gabrels wrote the songs for both Hours and the adventure video game Omikron: The Nomad Soul at the same time. According to Gabrels, they set up special writing sessions to write the music for these projects, then recorded demos in studios in Bermuda and Paris. Gabrels himself wrote over 3 hours of instrumental songs for the game (on top of the songs which he and Bowie had written together). Gabrels described these tracks as "more electronic and aggressive in nature than the Hours album" and suggested there would be an Omikron, The Nomad Soul instrumental album released the next year. Hours was thought of as the soundtrack CD for Omikron as late as June 1999. In the game, released by Eidos Interactive about a month later than the album, Bowie played the role of a character called Boz, while his wife Iman appeared as an "incarnable" who introduced "virtual reincarnation". Furthermore, Bowie appeared together with Gabrels and Gail Ann Dorsey as "The Dreamers", a virtual band performing in bars around Omikron City. Characters in the game could also buy a virtual album that they could listen to in their apartments. Omikron: The Nomad Soul included eight songs, all of them also appeared on Hours ("We All Go Through" only as a Japanese bonus track, but also as a related single b-side and on the 2005 bonus disc). At an E3 press conference Bowie said "I moved right away from the stereotypical industrial game-music sound. My priority in writing music for Omikron was to give it an emotional subtext. It feels to me as though Reeves and I have achieved that. We both worked really close with Quantic Dream to come up with eight new songs for the game." The game also included 34 "Instrumental Songs", of which 26 were written and performed by Gabrels and 8 by Bowie and Gabrels. Half of the tracks by Bowie and Gabrels were "easy listening versions" of some of the vocal songs. Some of the other "instrumental songs" would be further developed and released as b-sides, for instance "Awakened 2" is an instrumental version of "No One Calls" and "Thrust" (as heard during a rooftop fight with a demon) would become "1917". Only three songs on Hours were not from Omikron: "If I'm Dreaming My Life", "What's Really Happening" and "Brilliant Adventure" (although the latter was actually considered as incidental music for the game). Gabrels remembered how originally, "we did a different version of the Hours record, and I had played bass on that, and we let it sit and then we listened to it, and David said it was too raw. I thought it had a certain Diamond Dogs quality, but he wanted it to be more slick and polished and have fretless bass. … Mark Plati came in at the end of Hours to play fretless bass and remix the record." This was one of the changes that frustrated Gabrels, ultimately leading to Gabrels quitting working with Bowie a short time later. He said, "There’s a track from the Hours era that was a b-side called 'And We Shall Go To Town' that I thought was a key track for that album and it ended up being taken off the album, and that was part of the final straw for me. It was a very dark track." To drum up interest in the impending album, a "Cyber Song" contest was held on Bowie's personal website BowieNet to compose lyrics to an early instrumental version of the song "What's Really Happening". The winning lyrics would be featured on Hours. Contest winner Alex Grant also won a trip to Philip Glass' Looking Glass Studios on 24 May 1999 to watch Bowie record the final vocal during a live Webcast. There, Grant contributed backing vocals to the song, along with a friend who accompanied him. The original title for the album was going to be "The Dreamers", after the album's closing track. AllMusic's senior critic Stephen Thomas Erlewine wrote: "it may not be one of Bowie's classics, but it's the work of a masterful musician who has begun to enjoy his craft again and isn't afraid to let things develop naturally." Rolling Stone critic Greg Tate described the record as "an album that improves with each new hearing" and "further confirmation of Richard Pryor's observation that they call them old wise men because all them young wise men are dead". Similarly impressed, Alternative Press described Hours as "a masterpiece", adding that it "finds Bowie returning to basics he never should have left behind". Ryan Schreiber of Pitchfork criticised the album, saying: "Hours opts for a spacy, but nonetheless adult-contemporary sound that comes across with all the vitality and energy of a rotting log." Schreiber further stated: "No, it's not a new low, but that doesn't mean it's not embarrassing." Writing for Select, John Mullen considered the album to be an improvement on Earthling, but likened Bowie to a "more high-brow" version of Sting and concluded: "Even on the personal exorcism of 'Seven' there's a lack of urgency that suggests that the 'confessional' is just another style Bowie's trying out for size." An edition with additional tracks was released in 2004. In January 2005, Bowie's new label ISO Records reissued Hours as a double CD set with the second CD comprising remixes, alternate versions, and single B-sides. David took the album on the road for the 3-month "Hours Tour" in late 1999. In August, he appeared on VH1's "Storytellers", and in October, he appeared on the 25th season of "Saturday Night Live" to perform "Thursday's Child" and "Rebel Rebel". His appearance on "VH1 Storytellers" was released in 2009 as VH1 Storytellers. All tracks written by David Bowie and Reeves Gabrels; except "What's Really Happening? ", with lyrics by Alex Grant. ^ a b c Pafford, Steve (1999). "Wednesday's Child". Record Collector: 24–25. ^ Lariviere, Aaron (22 March 2013). "David Bowie Albums From Worst To Best: Hours..." Stereogum. Retrieved 25 June 2015. ^ "Billboard Newspaper". 5 June 1999. p. 101. ^ The Nomad Soul (manual/booklet) (PDF). Eidos Interactive. 1999. ^ Roberts, Chris (November 1999). "Station to Station". Uncut. pp. 44–64. ^ a b "David Bowie Hours …". Uncut. November 1999. p. 143. ^ a b Erlewine, Stephen Thomas. "Hours – David Bowie". AllMusic. Retrieved 26 April 2011. ^ Willman, Chris (11 October 1999). "hours …". Entertainment Weekly. pp. 77–78. Retrieved 13 January 2016. ^ a b Schreiber, Ryan. "David Bowie: Hours". Pitchfork. Retrieved 26 April 2011. ^ "David Bowie Hours …". Q. November 1999. p. 120. ^ a b "David Bowie: Hours: Music Reviews". Rolling Stone. 28 October 1999. Archived from the original on 22 June 2008. Retrieved 30 June 2010. ^ a b Mullen, John (November 1999). "David Bowie hours …". Select. p. 87. ^ Walters, Barry (November 1999). "David Bowie hours …". Spin. pp. 181, 184. Retrieved 13 January 2016. ^ "Hours - David Bowie". AllMusic. Retrieved 25 July 2017. ^ "australian-charts.com David Bowie – Hours..." (ASP). Australian Recording Industry Association. Retrieved 10 October 2013. ^ "David Bowie – Hours... – austriancharts.at" (ASP) (in German). Retrieved 10 October 2013. ^ "ultratop.be — David Bowie – Hours..." (ASP). ultratop.be/nl, Hung Medien (in Dutch). Ultratop. Retrieved 10 October 2013. ^ "ultratop.be — David Bowie – Hours..." (ASP). ultratop.be/fr,, Hung Medien (in French). Ultratop. Retrieved 10 October 2013. ^ "Top Albums/CDs - Volume 69, No. 26" (PHP). RPM. 18 October 1999. Retrieved 10 October 2013. ^ "Listen - Danmarks Officielle Hitliste - Udarbejdet af AIM Nielsen for IFPI Danmark - Uge 41". Ekstra Bladet (in Danish). Copenhagen. 17 October 1999. ^ "dutchcharts.nl David Bowie – Hours..." (ASP). dutchcharts.nl. MegaCharts. Retrieved 10 October 2013. ^ "finnishcharts.com David Bowie – Hours..." (ASP). Retrieved 10 October 2013. ^ "lescharts.com David Bowie – Hours..." (ASP). lescharts.com (in French). SNEP. Retrieved 10 October 2013. ^ "Album Search: David Bowie – Hours..." (ASP) (in German). Media Control. Retrieved 10 October 2013. ^ a b "Hit Parade Italia – Gli album più venduti del 1999" (in Italian). hitparadeitalia.it. Retrieved 10 October 2013. ^ "Highest position and charting weeks of Hours... by David Bowie". oricon.co.jp (in Japanese). Oricon Style. Retrieved 10 October 2013. ^ "charts.org.nz David Bowie – Hours..." (ASP). Recording Industry Association of New Zealand. Retrieved 10 October 2013. ^ "norwegiancharts.com David Bowie – Hours..." (ASP). Retrieved 10 October 2013. ^ "swedishcharts.com David Bowie – Hours..." (ASP). Sverigetopplistan. Retrieved 10 October 2013. ^ "David Bowie – Hours... – hitparade.ch" (ASP). Retrieved 10 October 2013. ^ "David Bowie > Artists > Official Charts". UK Albums Chart. Archived from the original on 3 November 2013. Retrieved 10 October 2013. ^ "Hours - David Bowie". allmusic.com. Retrieved 31 August 2011. ^ "Les Albums Or". infodisc.fr. SNEP. Archived from the original on 28 August 2012. Retrieved 24 August 2012. ^ "French album certifications – David Bowie – Hours" (in French). Syndicat National de l'Édition Phonographique. Retrieved 10 October 2012. ^ "British album certifications – David Bowie – Hours". British Phonographic Industry. Retrieved 10 October 2012. Select albums in the Format field. Select Silver in the Certification field. Type Hours in the "Search BPI Awards" field and then press Enter.